Lock in a great price for LetoMotel München Moosach – rated 8.5 by recent guests! Gud transport systems sound the hotel. No back ground sounds from out side the hotel. The staff was outstanding. Location was good, next to train, subway and tram. It’s a location, very easy train ride over to the center plaza. There are lots of homey locations around LetoMotel that made it more German and too touristy. That being said, a few people did speak English. So, just be ready for that. Accommodation is really small and clean. It does not have enough room space for big luggage. Staff is very helpful . Convenient location ... close to transportation .. Very convenient to transport to the city. A nearby restaurant served good food at a reasonable price and with friendly staff. Wifi available in the room, although on my first stay there it was down due to problems in general. The location was very convenient for public transportation and it was just a short train ride to the main city center of Munich. LetoMotel München Moosach This rating is a reflection of how the property compares to the industry standard when it comes to price, facilities and services available. It's based on a self-evaluation by the property. Use this rating to help choose your stay! One of our best sellers in Munich! LetoMotel München Moosach is in the Moosach district of Munich, right across from Moosach subway station. It features soundproof rooms, free Wi-Fi and a 24-hour front desk. Every soundproof room at the LetoMotel München Moosach has a private bathroom, tea/coffee facilities and a flat-screen TV with satellite channels. Some rooms feature a private roof terrace. Moosach Station has a direct connection to Munich Airport and Munich Central Train Station. Underground trains run every 10 minutes to the historic Marienplatz Square and to the Olympia shopping center. Guests can enjoy a varied breakfast in the bakery, which is a 1-minute walk from LetoMotel München Moosach. There are many restaurants, bars and a pharmacy within walking distance. When would you like to stay at LetoMotel München Moosach? Air-conditioned room with a flat-screen TV and free Wi-Fi. This room also offers extra space and a roof terrace. The LetoMotel is in the Moosach district of Munich, directly opposite Moosach Underground Station.We offers soundproofed rooms, free Wi-Fi and a 24-hour reception. House Rules LetoMotel München Moosach takes special requests – add in the next step! LetoMotel München Moosach accepts these cards and reserves the right to temporarily hold an amount prior to arrival. Please note that payment may be required upon arrival. The room with the terrace was great, but the 2nd room I had was much smaller and a bit cramped, but clean and simple. The room was spacious and the design was practical. 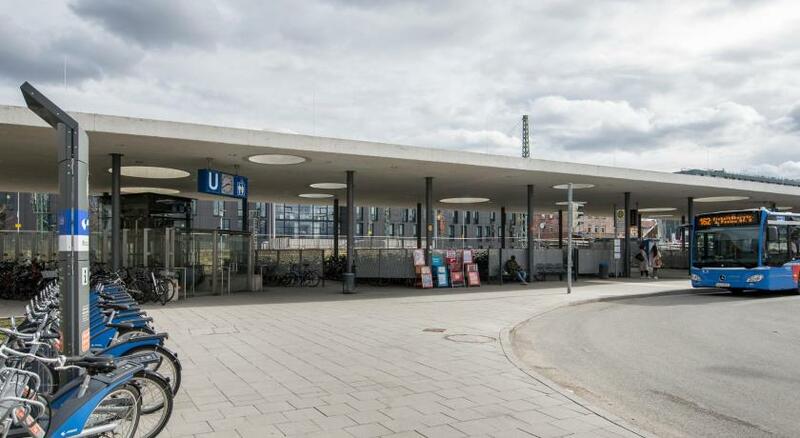 Very convenient location - next to r/w station and U-Bahn. Great and convenient bed . Very good prise. Loved staying there. Very clean hotel. Very friendly and accomodating staff. The location was awesome and next to all kinds of transportation. Very easy and fast to get everywhere. The neighborhood is safe, quiet and nice to walk around and explore a bit. A perfect location for travelling in and around the city. Friendly staff and a clean hotel, cannot ask for more! Just an environmental friendly suggestion to switch single use paper cups to ceramic ones. Great location, neat, clean and perfect for a short stay. Very friendly staff. You can find a nice bakery next door to have breakfast. perfect location .. near city center .. clean .. Excellent staff very polite and helpful. The shower was clean but draining the water slowly. The check-in was very quick with a nice conversation with Hazem from hotel stuff (thanks to him :)). The room was very clean and comfy, but a bit noisy when people are talking on the street under the room window. Available shower gel/shampoo in bathroom is too small. Rooms while small are well equipped and clean. Location is just great as you have access to public transportation within few meters from hotel. Personnel is friendly and helpful.